Want to celebrate Cinco de Mayo this Friday but not into slamming tequila shots and drowning yourself in light Mexican beer? We’re here to help. Armed with three bottles of Corralejo Tequila (Silver, Reposado, and Añejo), we’ve selected three drink and cigar pairings with cigars featuring the increasingly popular Mexican San Andrés wrapper. Corralejo, made in the Guanajuato state of Mexico, is one of just a handful of companies granted the right to produce tequila outside the spirit’s best known home in Jalisco. Made with 100% blue weber agave, the company uses unique production techniques—employing the Charentais method (commonly associated with cognac distillation) for second distillation—which takes place in an Alembic copper pot still imported from Tomelloso, Spain. Even if you’re not familiar with Corralejo brand by name, you may recognize the colorful red, white, and blue bottles. First off, I’m a big believer that sour mix in margaritas is only useful to cover up harsh, bad tequila. So please skip it. Instead, go with this simple recipe that uses only fresh squeezed lime juice, quality tequila (in this case, Corralejo Silver), Cointreau or Grand Marnier, and ice. If that’s too tart for you, a splash of simple syrup can be added, but nothing more. Serve it on the rocks or up strained into a cocktail glass. Personally, I skip the salt. If such stories are to be believed, the Undercrown blend was created by the rollers responsible for making Drew Estate’s popular Liga Privada No. 9. Made with a Mexican San Andrés wrapper along with a Connecticut-grown stalk-cut Habano binder and Nicaraguan and Brazilian filler tobaccos, the cigar produces roasted coffee, sweet cream, and nutty flavors along with copious amounts of highly aromatic smoke that stands up well to a well-made margarita. If you’re not the margarita type, El Diablo is a simple yet tasty tequila cocktail. Just shake 1.5 oz. Corralejo Reposado tequila, .5 oz. crème de cassis (I used a small batch Cassis made by the Mt. Defiance Cidery and Distillery in Virginia), and .5 oz. fresh lime juice, then strain into an ice-filled highball or Collins glass. Add 2–3 oz. of ginger beer (I had some Goslings on hand) and garnish with a lime wedge. The Turrent family is the most prominent when it comes to Mexican cigar tobaccos. (Over the years, there have been a number of Turrent-branded cigars, and they also make the well-known Te-Amo line.) Their 1901 blend uses three types of Mexican tobacco, including a San Andrés maduro wrapper, along with Nicaraguan tobaccos. 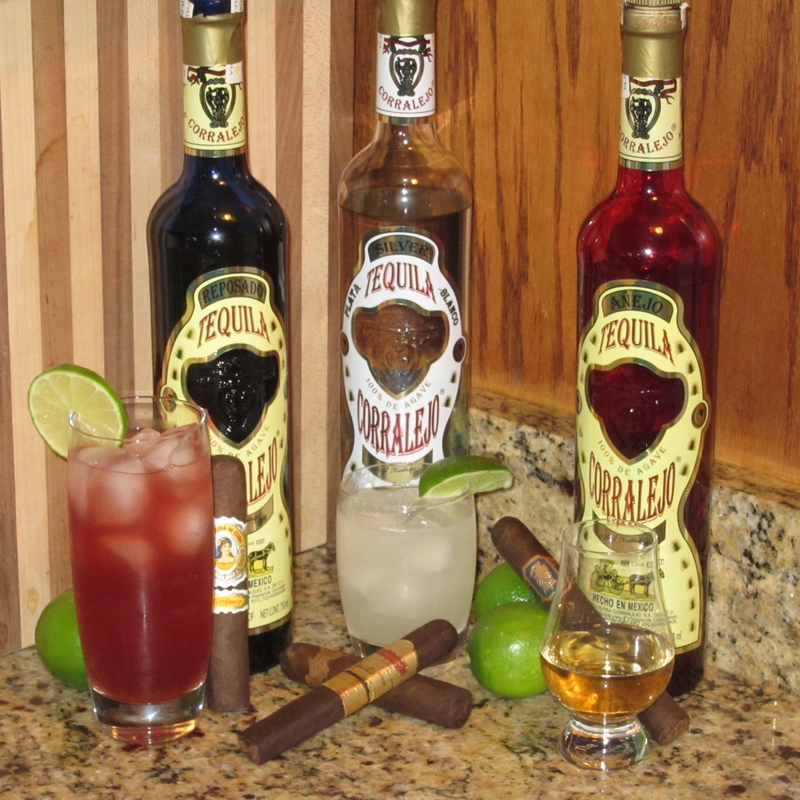 The cigar’s dry richness, woody spice, and meatiness contrast nicely with the sweetness of the El Diablo cocktail. Though better known for margaritas or shots, fine tequila is best enjoyed neat or maybe with a single ice cube. Corralejo Añejo is no exception. Pale straw in color, the tequila features aromas of fresh agave, lemon, and vanilla. The body has light oak, buttered corn, pear, and a little pepper spice. The finish is clean. All in a bright, crisp, very smooth tequila that, at about $40, stacks up favorably to many higher-priced tequilas. La Aroma de Cuba Mi Amor is one of my favorite San Andrés cigars. It has a dark, oily wrapper around Nicaraguan binder and filler tobaccos. The most prominent flavors are coffee and roasted earth, and there is also a nice bit of complexity with dry bittersweet chocolate and a hint of nuttiness. Medium-bodied and well-balanced, it neither overpowers nor is overpowered by the subtle, smooth flavors of straight Corralejo Añejo. Stop telling people Anejo tequila can be enjoyable neat. We don’t want a bubble in tequila like bourbon is facing.